Pages etc. : vii+272p., full of col. illus., 28cm. (16th Conference of the International Association for Ladakh Studies Heidelberg 17-20 April, 2013) Contents: 1. Alchi Tsatsapuri: Notes on the History of an Early Monuments by Andre Alexander; 2. Lost and Gone Forever: Notes on the Demolition of the 23 Red Temple of Hunder by Noor Jahan Chunka And Gerald Kozicz; 3. Fortifications of Ladakh: A Brief Chrono-Typology by Quentin Devers; 4. The Munshi House in Leh: A Building History by John Harrison; 5. Castles and Defensive Architecture in Purig: An Introduction, Survey and Preliminary Analysis by Neil Howard; 6. The Old Stupa of Matho by Gerald Kozicz; 7. Visual Representation of Ladakh and Zangskar in the British; Library's Wise Collection by Diana Lange; 8. Siddhas and Sociality: A Seventeenth-Century Lay Illustrated; Buddhist Manuscript in Kumik Village, Zangskar (A Preliminary Report) by Rob Linrothe; 9. 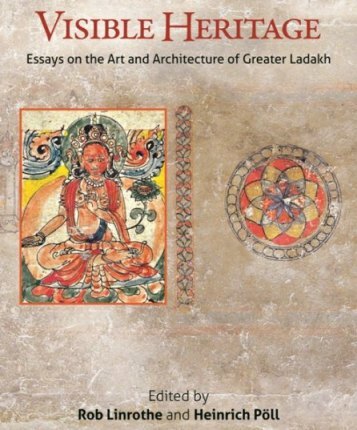 Trees-of-Life, Aquatic Creatures and Other Enigmatic Motifs; on Ladakhi Wood Art: What They Tell Us About Art History by Heinrich Poll; 10. The Life of Buddha Sakyamuni in the Byams pa lha khang of Basgo, Ladakh by Verena Ziegler.